It might just be our imagination, but the consensus at Blair Candy Headquarters is that September was the fastest month this year! It seems we just turned the calendar page, and tomorrow we will be turning it again. While we hate to see time move so quickly, when each passing day gets us closer to Halloween, we can hardly complain! Not only is it a fun-packed holiday full of sweets, but decorating for Halloween is a treat unto itself. As much as I love my pretty Christmas décor, the creepy, cute, and creatively-designed decorations for Halloween are my favorite. And this year, I’ll be adding plenty of edible awesomeness to my decorations by incorporating Halloween candy into the design! Decorating with Halloween candy can be as simple or as complex as you like. We’ve put together a little list of ideas for how you can add something sweet to your decorations this year, but don’t be limited by our ideas! Use as many or as few as you like, and always feel free to exercise your creativity and see what you can dream up. Just don’t forget to share it with us in the comments so we can try it, too! Break out the Halloween candy bowls. Whether they are shaped like pumpkins and ghosts, or are simply ceramic bowls in the shades of the season, scattering candy bowls throughout your house not only adds a homey touch, but makes it easy to grab a caramel apple pop or two no matter which room you’re in! Show the sweeter side of potted plants. If your thumb is lacking a green hue as much as mine, chances are good that you’ve lost more than one potted plant in your day. So what’s a guy or girl to do with all those pretty, empty pots? Fill them with marbles or decorative rocks of course! Once your pot is filled to within an inch or so of the top, plant some Halloween lollipops inside. Our witch finger lollipops won’t wilt like a daisy or sunflower, and they taste a lot better, too. So don’t be surprised if some of your ‘flowers’ go missing as time goes on! Let guests know they’re being watched! We don’t recommend actually spying on your friends and family members, but you can add to the creepy feeling of being watched by adding gumball eyes throughout your home. Peeking out from behind pictures, sitting next to the hand soap in the bathroom, hanging from strings inside the refrigerator door – anywhere spotting a set of eyes peeking back will freak someone out is the perfect location! Sugar Free and Gluten Free Halloween Candy at Blair! Whether you are shopping for candy that works with your own dietary needs, or want to ensure that every Trick-or-Treater that stops by will find something that suits their needs in your bowl, our Sugar Free Halloween Candy and Gluten Free Halloween Candy sections are for you! Following a gluten free or sugar-conscious diet can be tricky at times, and the holidays are perhaps the hardest times of all. But for as difficult as it can be to turn down a treat that it seems everyone but you can eat, you know you’re doing what’s best for you! And luckily, while you, your children, or a few Trick-or-Treaters may have restrictions on what they can consume, candy is not an all-or-nothing indulgence. In fact, BlairCandy.com offers a delicious assortment of sugar free candy and gluten free candy that would tempt any tastebud! Many people are surprised by some of the candy they find in our gluten free selection. These aren’t specialty candies that you’ve never heard of – they’re favorites that we’ve all been happily enjoying for many years. They just happen to be gluten free as well as scrumdiddlyumptious! 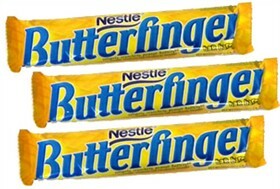 Some All-Stars you might recognize best include Butterfinger candy bars, M&M’s, and Reese’s Peanut Butter Cups. Gummy candy is also often gluten free, and your many mouthwatering options include Gummy Peaches, Trolli Strawberry Puffs, and a favorite of so many kids – Sour Gummy Worms! What’s soft, orange, oh-so-yummy, and melts in your mouth? We’ll give you a hint…It’s not carrots, and it rhymes with ‘beeps’. Ohhh, it must be Peeps! But these aren’t just any Peeps; these are Sugar Free Peeps shaped like pumpkins! Each pack contains three petite Peep pumpkins sweetened with Splenda, ready to brighten your day the sugar free way. Prefer something that lasts a little longer? Because let’s face it…if there are Peeps in the house, they don’t exactly get a lot of time in the pantry before they’re in someone’s belly. And for those times that you need a sugar free candy fix and the Peeps have gone missing, or you are filling a few sugar free Halloween treat bags to have at the ready, our selection of Brach’s sugar free hard candy makes a sweet choice. Choose from sugar free versions of candy classics we all love, including butterscotch hard candy and cinnamon hard candy. 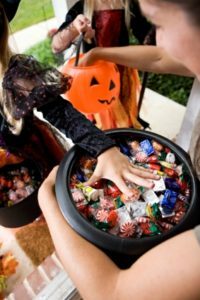 To make it easy for kids and parents alike to know you have sugar free and gluten free candy available for Trick-or-Treaters, consider setting up 3 baskets or boxes to hold your Halloween treat bags. Simply attach a ‘Sugar Free Halloween Candy’ index card to one, and a ‘Gluten Free Halloween Candy’ index card to another to separate the sweets. Affixing the identifying cards with a clothespin should do the trick for your treats! Cool, Colorful Halloween Lollipops Are Frighteningly Fun and Flavorful! 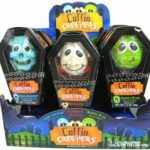 Coffin Creepers Halloween Lollipops – As if the clever coffin packaging wasn’t enough to make these a must-have, the adorable little creatures peeking out from the windows captured every heart at Blair the moment these arrived. One of my favorite things about Halloween is all things ‘scary cute’, and these are topping my list this year. As for the flavors, my personal fave is Bone Rattlin’ Blue Raspberry (plus, I can’t resist his oversize innocent smile! ), but Vampire Very Cherry and Mummy Wrap Green Apple are scary good as well. Crazy Bones Lollipops – These tiny little lollis feature a fruity, round lollipop top attached to…a plastic arm or leg! 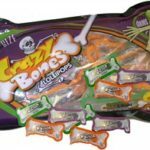 Yes, where you might expect the elbow or knee to be you’ll find candy instead, which means that while eating a Crazy Bones lollipops everyone sees a little hand or little foot peeking out of your mouth! 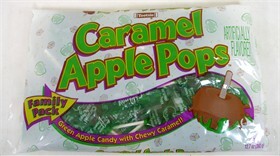 As for the flavors, these come in an assortment of classics: orange, grape and green apple. And while we don’t know for sure, we think they taste better than a real arm or leg by a landslide! 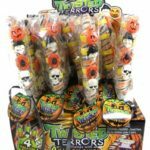 Twister Terror Halloween Lollipops – These cherry-flavored lollipops have a funky, modern feel to them, but also have an element of classic candy charm with their twist design. This update on an old-fashioned candy store staple is re-imagined in the shades of Halloween – orange, black and white – and decked out with 4 awesome Halloween rings per pop before being wrapped and cinched with a black ribbon! These make a memorable treat for friends, family and trick-or-treaters, who always remember the houses that give out the best stuff! Halloween Candy and Corduroys: Welcome, Fall. We Missed You More Than We Knew! I’ve had a touch of Fall Fever for weeks now. As usual, it started slow, eyeing up all the decorations in stores, dreaming of changing leaves and the many pumpkin-flavor-infused treats that have just begun popping up at coffee shops. But it progressed beyond casual, fleeting fall thoughts. I have found myself absent-mindedly searching for fall recipes online, with visions of corduroys swishing in my head. I’ve retired all but one pair of flip-flops to the closet, and dusted off boxes with beautiful boots inside! But it wasn’t until this past weekend that Fall Fever got a solid hold over me, and I don’t think it will be letting go. A cousin celebrated her upcoming marriage with a bridal shower this weekend, and decked the halls in fall-tastic-ness. The venue itself had a warm, autumnal ambiance, with rich woods, exposed beams, and wrought-iron touches here, there and everywhere. And in this naturally ‘fall’ location she draped tables and chairs with burgundies, deep oranges, chocolate browns and mossy greens. Decorations and favors were rustic and fall-themed as well, relying heavily on a pumpkin motif, but not the brightly-colored pumpkins specific to Halloween – fall-y pumpkins! The setting was at once opulent and cozy, luxurious and laid-back…kind of like fall itself. And in the midst of all this marvelousness was something supremely sweet that gave an air of sugary magic to it all – a candy bar. And when the festivities were over, and all the hugs had been had and well wishes wished, I walked slowly back to my car through the gorgeous grounds with my candy in hand. I took the long way – through the garden, past the pool, down a tree-lined path. I appreciated my surroundings…appreciated the fall in the air…enjoyed my lollipop without rushing a bite. I let summer slip away a little more with each step, and fell gently into fall.